EMC + SIPI 2017 Call for Papers is Open! Need Help Organizing your Paper? Read our Technical Paper Writing Flowchart. 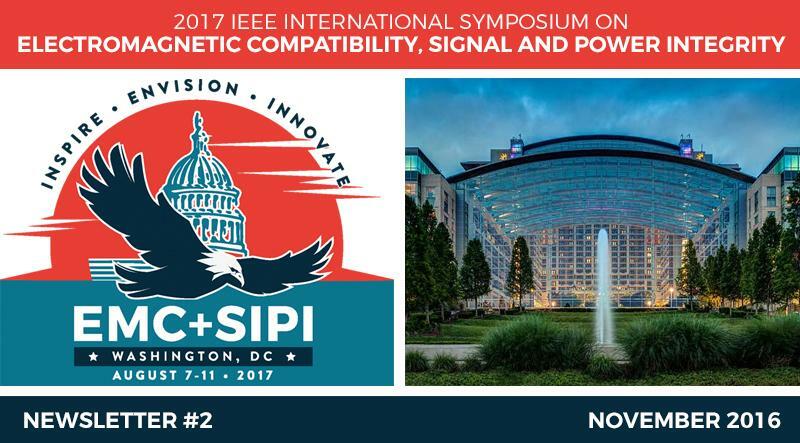 2017 EMC+SIPI ONLINE will be broadcast live from Washington DC, August 7 to 11, 2017. This five day, digital event will feature selected sessions on EMI/EMC, signal integrity and power integrity presentations, in the form of online webinars. 2017 EMC+SIPI ONLINE will be co-hosted in conjunction with the traditional 2017 EMC Symposium. The digital symposium is being offered as a supplement to the traditional symposium to provide the opportunity for individuals who can't attend to be able to experience some of the presentations in real-time and in recorded videos for viewing later. The availability of the online option will be of particular interest to academia and students as a way to "virtually" sit in on technical sessions and learn from some of the leading EMC and SIPI engineers on the planet. Paid onsite attendees will have free access to 2017 EMC+SIPI ONLINE to provide a means to watch presentations that they otherwise would have missed due to conflicts with concurrent sessions or perhaps re-watch sessions of particular interest. ATTENTION STUDENTS: Need Help Organizing your Technical Paper? Students may not have experienced the preparation and submission of a technical paper. To assist in the process, we enlisted help from Joseph Vas, IEEE EMC Society Student Liaison. Joseph has prepared a flowchart to help students organize their content for a technical paper. The EMC + SIPI 2017 attendees hail from some of the world's most innovative companies in technology, military, automotive, space, medical and many others. An accepted paper will gain exposure for students and can lead to career opportunities! The IEEE EMC Society is seeking original, unpublished papers covering all aspects of electromagnetic compatibility, including EMC design, modeling, measurements and education. Graduate and undergraduate authors are eligible for the Best Student Paper contest. The student must be the primary author and should indicate that they wish to be considered for the contest when submitting the preliminary manuscript. Each student’s professor will be asked to certify that the paper is primarily the work of the student. Students submitting EMC and SIPI Technical Papers must plan to attend. Authors of accepted papers will be invited to submit an extended version of their symposium paper for possible publication in a special issue of the IEEE Transactions on Electromagnetic Compatibility.